This is a blog about donuts in Thailand. Over the years, I’ve observed donuts in a number of locations, from chain stores to open-air markets. 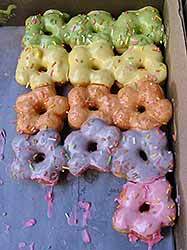 This blog shows some of the donuts I’ve seen over the years. 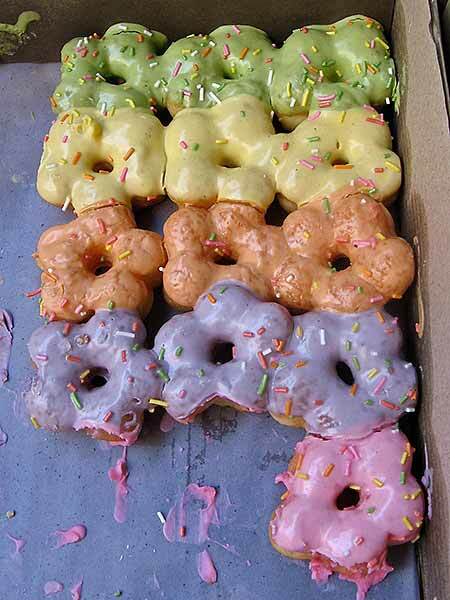 It would appears that donuts are fairly popular. In January 2011 we happened to be visiting Siam Paragon shopping center. 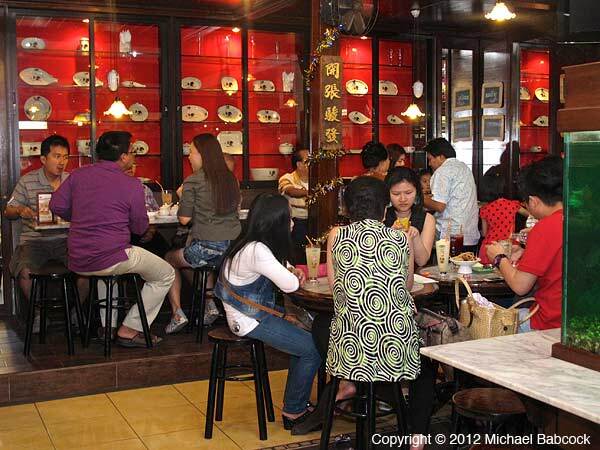 We saw a line of perhaps 50 or 60 Thais, out the door, and wondered what the fuss was about. Turns out they were all lined up for Krispy Kreme donuts; we saw people walking away with two large boxes of donuts. I didn’t have my camera but you can see a photo of the phenomena at Krispy Kreme Opens in Bangkok | everythinghapa (opens in new page). Thais were still lining up half a year after the stores official opening. 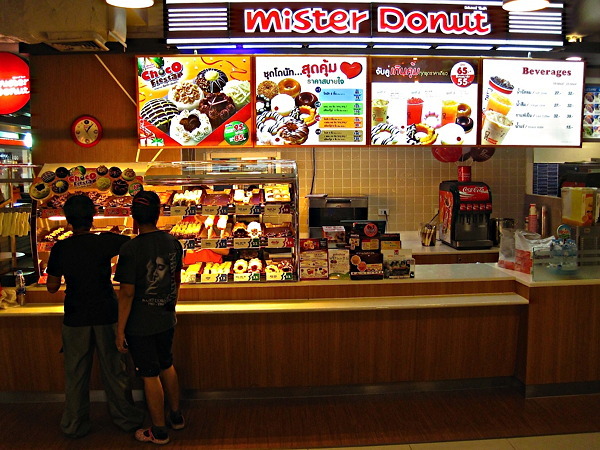 Certainly, this reflects the inroads in Thailand of Western food chains, something discussed at Indigenization of Thai Restaurants Overseas: Part 1 – American Fast Food Chains in Thailand. 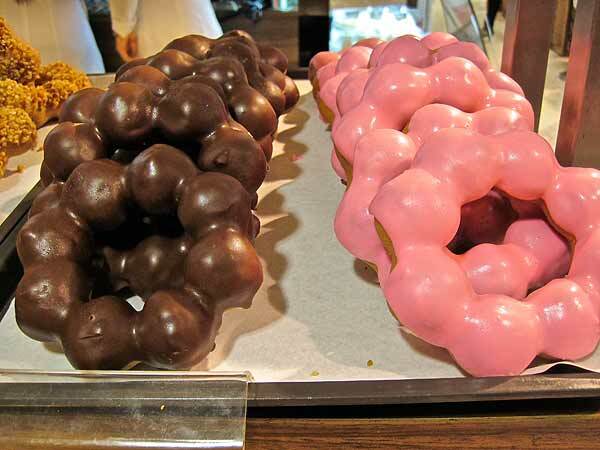 These days you can find lots of donuts in any shopping center. 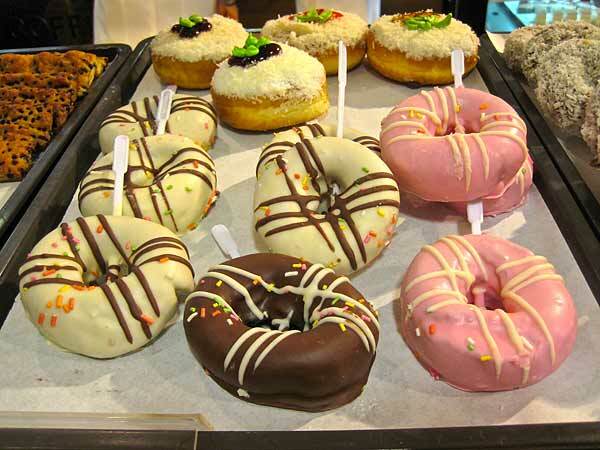 There are inevitably a chain or two – Mr. Donut and Dunkin’ Donuts are popular – but you can also find donuts in the ground-floor supermarkets (found in every mall) as well as in the many stores (usually a dozen or more) selling western-style baked goods. 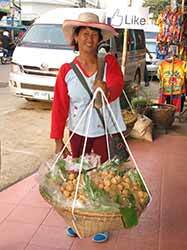 You’ll find them in open-air markets, from vendors on the street and even from hawkers carrying two baskets suspended by a bamboo pole. 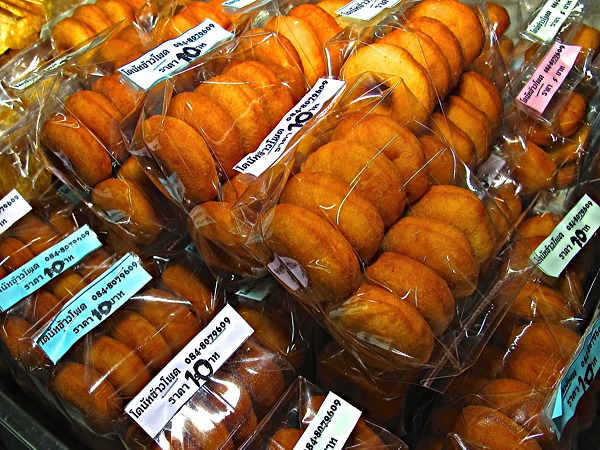 As with the first picture above (taken at a Bangkok outdoor market in 2008), the donuts are often brightly glazed. The Thais also have some snacks that are very reminiscent of donut holes. 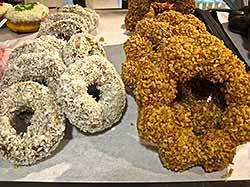 In Oakland we have donut savant (link goes to their Facebook page in new window), which makes the best donut holes around. Here are two pictures of a “Thai donut hole.” I bought this snack from the hawker shown in the picture to the above right in Sukhothai. They reminded me of donut savant so I gave them a try. 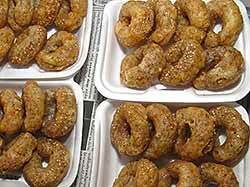 They were somewhat sweet (deep-fried and glazed) and contain a mung-bean filling, shown to the left, that is barely sweet. They weren’t bad! Here are two pictures from Ayuthaya back in 2004. 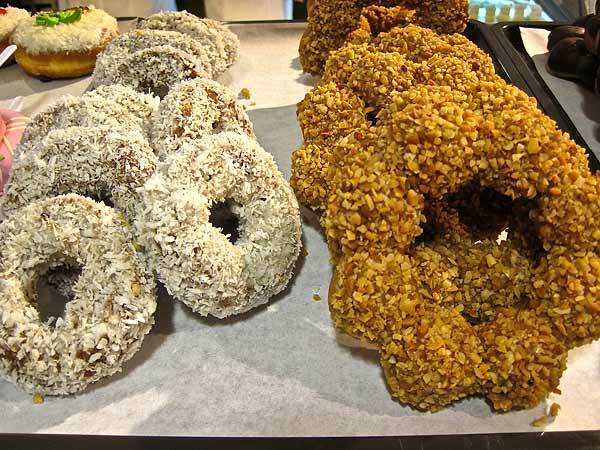 These donuts were sold by the hawker in the left picture. There are highly glazed donuts in the front basket and more traditional snacks in the back basket: the backmost (white) snack is a traditional snack rolled in coconut shreds, and the middle snack is a type of fried dough. Above to the left are more glazed donuts from the morning market in Sukhothai. 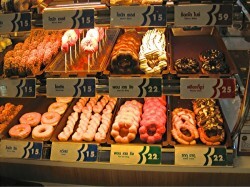 To the right, are some colorfully decorated donuts from the bakery at Tops Supermarket at MBK center in Bangkok. 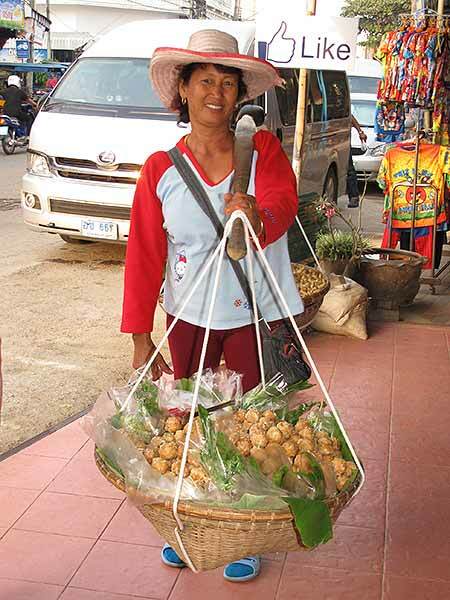 These pictures are both from the market in Mae Hong Son. 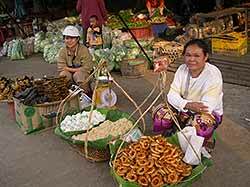 The leftmost picture again (as with the hawker above) shows western and Thai snacks sold by the same person. 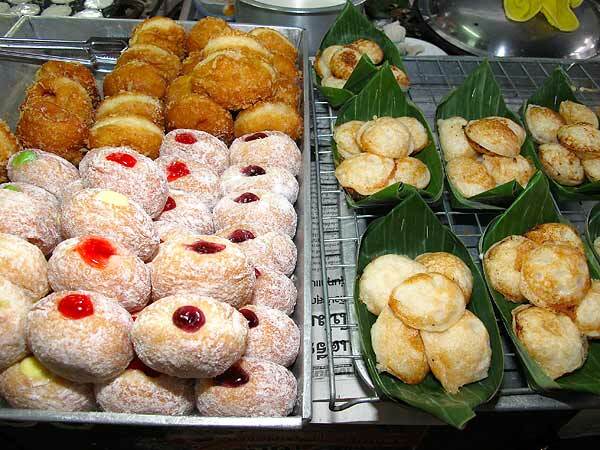 The left tray has very tightly rolled donuts in back next to powdered jelly donuts in the front. The right trays show coconut pancakes (kanom krok) sold in banana leaf baskets: truly the traditional is meeting the modern here! 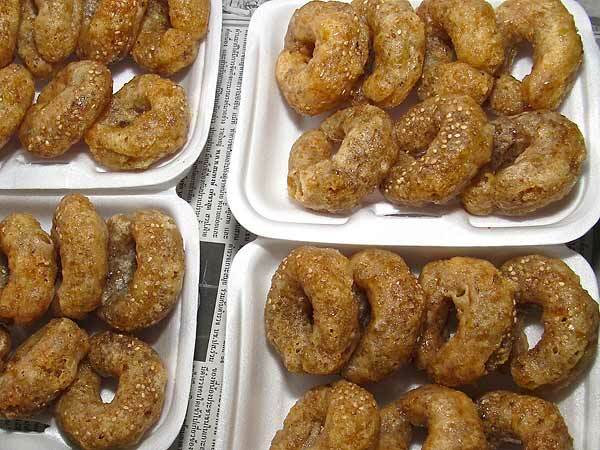 The picture to the right shows deep-fried donuts, some with sesame seeds. 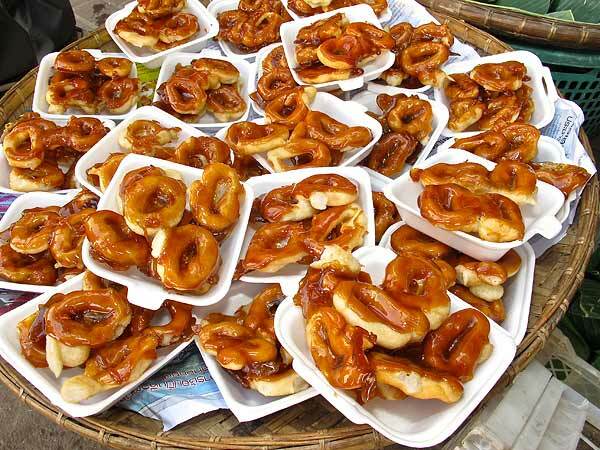 These are also from the market in Mae Hong Son and show small donuts sold pre-packaged in a plastic bag – 8 for 10 baht (about 35 cents at the time)! 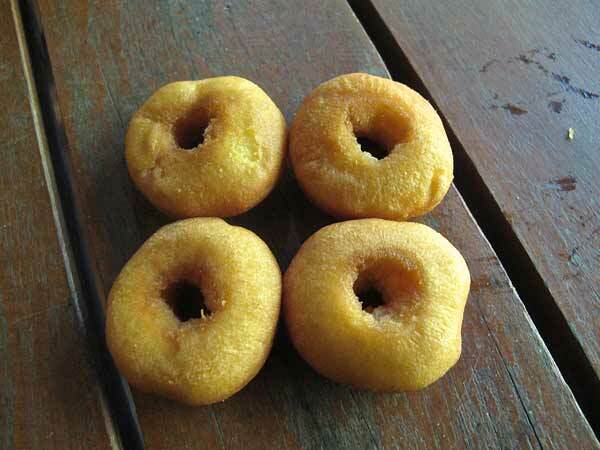 I tried these donuts – each one was about two bites: they tasted just like a plain cake donut back in the states. Not bad. 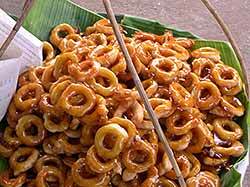 I should note that like Sukhothai, this market is frequented mainly by locals with just a few tourists; it is certainly the locals who are the target audience for these supposedly western sweets. 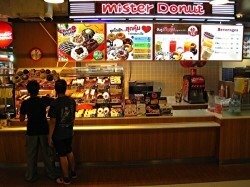 Here are two more pictures of the donuts available at Tops Supermarket at the MBK center in Bangkok. My, they do like highly frostinged donuts! 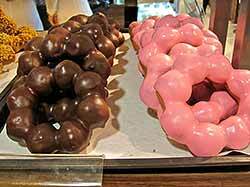 The ones to the right are less sweet. There is a type of noodle dish in Thailand called “yentafo” (เย็นตาโฟ) and, as it happens, there is also a restaurant chain named “Yentafo Kreung Songe” – เย็นตาโฟเครื่องทรง. I recently had lunch at one of these restaurants and had a very delicious and satisfying bowl of noodles. 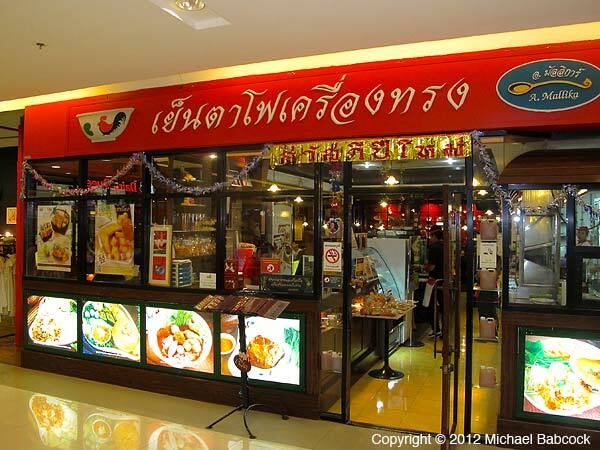 This chain is owned by the same people who operate one of our “go-to” restaurants in Bangkok – A. Mallika, the subject of my recent blog A Mallika Restaurant in Bangkok. Apparently Mallika does food very, very well. 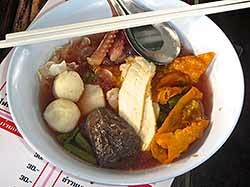 Yentafo (sometimes spelled as three words – yen ta fo) is a fish noodle soup colored with a red sauce which contains red fermented tofu. It may include fish dumplings, fish balls, sliced fish sausage, fried tofu, squid, white woodear mushrooms and phak boong (a popular Thai vegetable often called “morning glory”). 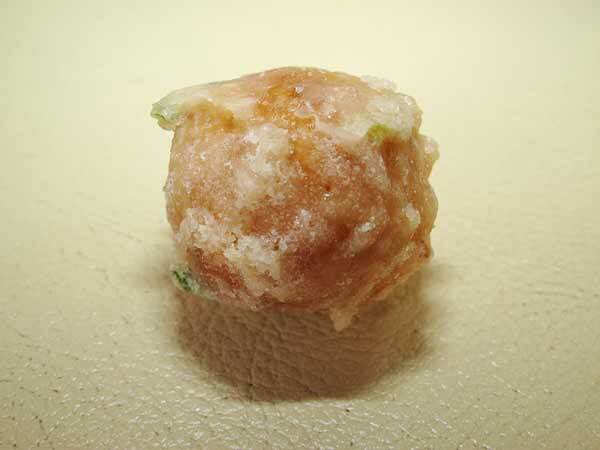 It is sour and a bit sweet with a touch of salty. I like it spicy-hot. 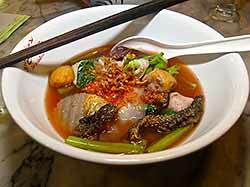 At Yentafo Kreung Songe, they use only flat noodles made from local rice flour; they say that these noodles shorten the cooking time so that their food can be served very quickly. Among the ingredients found in their Yentafo are sh balls, shrimp balls, white tofu meatballs, egg tofu meatballs, fish dumplings, fried fish sausage, crisp octopus, ear mushrooms, pork blood jelly and deep fried fish skin. 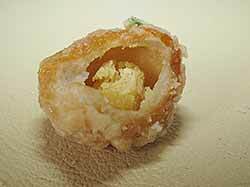 I particularly like having the deep-fried fish skin, as it adds another dimension of texture. The pork blood also adds texture and, in addition, gives more substance to the broth. According to their website, “A bowl of A. Mallika’s Yentafo contains more than 10 ingredients that really differentiate the Yentafo from others’ and hence the name ‘Krueng Song. '” Kreung songe is a phrase that is a bit difficult to translate; essentially the name suggests that this yentafo is something different from other versions, something special. There are three options for yentafo on the menu here. The first choice has no chilli pepper indicator next to it and roughly translated means “not spicy, for children.” Choice #2 has 2 chillies next to it and is “hot to pierce the heart.” Option #3 with a 3-chilli indicator is rated as “painful.” For my taste, and I like reasonably hot food, “hot until it pierces the heart” is plenty hot for me! 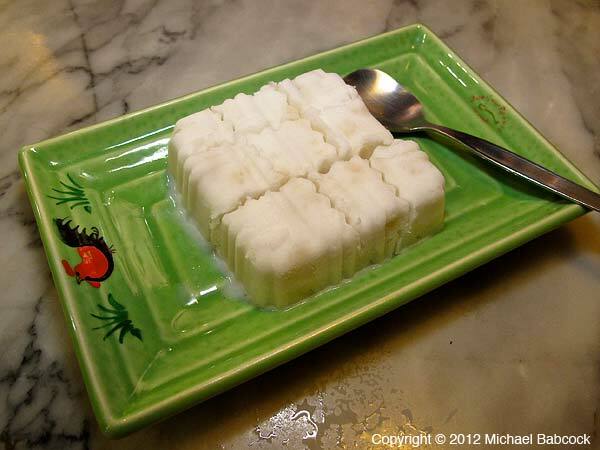 A great way to finish the meal is with a plate of custard apple ice cream, or young coconut sorbet. Whether you have just “pierced the heart” or experienced “pain,” it’s a good way to end the meal. I very much enjoy the yentafo at this chain of restaurants. They serve a delicious bowl of noodles: I find that I need not make any adjustments from the ubiquitous Thai condiment set that accompanies nearly all noodles in Thailand. Kasma tells me that yentafo is usually served not spicy in most noodle shops, leaving the diner to make adjustments from the condiment set to his or her taste. There are 17 branches of the chain located around Bangkok. We had ours at the Seacon Square branch. There are other items on the menu and given that the chain is owned by A. Mallika, they are probably excellent. I just go here for the yentafo and have not yet had the chance to try anything else. To the left is the bowl from Yentafo Kreung Songe at Seacon Square in Bangkok. To the right is the bowl from Samut Sakhon Yentafo in Chiang Mai. Written by Michael Babcock, February 2013. 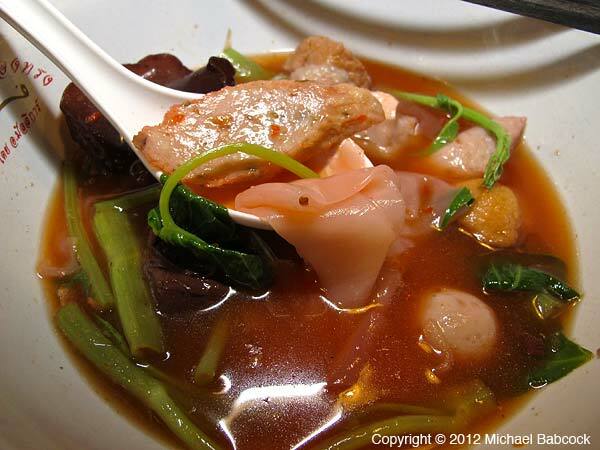 You are currently browsing the Thai Food and Travel Blog blog archives for February, 2013.